← It’s November! Read a #Classic! “A long-buried family secret has come back to haunt Special Agent Aloysius Pendergast. 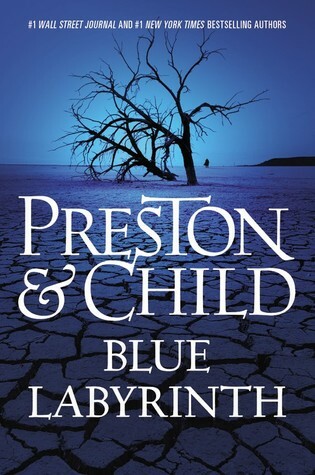 Blue Labyrinth is the fourteenth book in Preston & Child’s Pendergast series. It seems that with each new book, the authors write an even better and more intense story. I haven’t been so involved with a series before and I don’t see myself walking away from Special Agent Pendergast’s life anytime soon. The complexities of his character and family history, while being slowly revealed to the reader over time, never cease to grow more mysterious and intriguing. The authors waste not time getting into the action with this book. Right from the beginning the reader is thrown into Pendergast’s next case. And for the next couple of hundred pages, the story unfolds with little downtime. For long-time fans, this book is going to be an emotional ride, as well. Pendergast is at his most vulnerable in Blue Labyrinth. A feeling of uncertainty about the story’s outcome gripped me until the very last page. Another thing I enjoyed about Blue Labyrinth was that Constance was able to show how formidable of person she is. She’s been slowly getting more and more involved in the storyline with each book, but I feel as if she’s really stepped out of the shadows here. We also see much of Margo Green and D’Agosta. These books wouldn’t be complete without those two veteran characters. It’s so hard not to dive deep into the story and describe what made this another Preston & Child masterpiece without ruining all the twists and shocking moments for potential readers, so I won’t. Just know that this novel is one of the best yet. It’s a big change from the norm for the series but also such a fitting storyline. I don’t know what these two authors have in store for readers next time, if there is a next time, but I already want to get in line for it. This entry was posted in Review and tagged Aloysius Pendergast, ARC, Brooklyn Botanical Garden, Child, D'Agosta, Douglas Preston, FBI, Lincoln Child, Louisiana, Mystery, New York Museum of Natural History, NYPD, Pendergast, Preston, Preston Child, Review, Salton Sea, Series, Special Agent, Suspense, Thriller. Bookmark the permalink.